At Sargento, we're always looking for delicious new ways to share our passion for cheese...like our new Off the Block shredded cheese! Off the Block shreds, grated from blocks of 100% natural cheese, come in two cuts: Traditional Cut and Fine Cut. 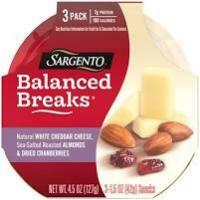 So whether you are sprinkling, tossing or melting, Sargento has the cheese for you! I love Sargento Cheese. I buy it every chance I have.